Earlier this week I presented at the Hillsborough County STEM Academy about growing vertical. I gave a summary of a STEM (Science, Technology, Engineering, and Mathematics) lesson titled, “Vertical Farming: How to Feed 9 Billion People.” The lesson is aligned with the state’s math and science 7th grade curriculum. I was happily surprised when not only 7th grade teachers attended but also first grade teachers through high school. These teachers took part because they understand the importance of inspiring future gardeners. The lesson provides participants with everyday household objects including 8” x 8” aluminum pans, Dixie cups, string, duct tape, wooden dowels, soil and seeds. The lesson challenges students to make a vertical garden at least three levels high. One of the goals of the lesson is for the students to learn that you can grow much more food vertically than horizontally, when given the same amount of space. Growing up will most likely be necessary by 2050 when the human population is estimated to reach 9 billion. Growing vertically in our modern day garden has many benefits, one of which is the ability to save space, as seen in the STEM lesson. Growing up, also means an increase in accessibility – you will not have to keep bending down to harvest. Getting the plants up off the ground can also improve air circulation. This helps with the health of the plants and reduces pest and disease problems. Growing vertically also minimizes damage due to animals digging up gardens on the ground. Since growing up saves space, you can grow a wider range of varieties and cultivars. Prior to, or at the time of seeding, you should install a structure that your vining, twining edibles can latch onto for support. When edibles such as pole beans, peas and tomatoes have support they will produce a higher quality crop which is easier to harvest. In addition to recycling headboards and the bottom grates of old bird cages into trellises; I have been known to use more traditional materials such as bamboo and twine. Using a total of seven pieces of bamboo roughly 6’ or longer and string, you can create a sturdy double –teepee string trellis. Make three bamboo poles into a tripod for each side of the trellis. Use the seventh bamboo pole to connect the two tripods. Tie the string vertically and horizontally to provide support. You can then transplant or seed directly at the bottom of each vertical string. Using biodegradable string or twine allows you to cut all the string off at the end of the season and compost the dying plants as well. Storing the bamboo stakes in a barn or carport will extend their life for a few years. Another option is to tie five or more bamboo or wooden stakes together several inches from the top. The poles should be 6’ or longer. Create a teepee structure and add twine between the poles for extra support. To ensure the teepee is sturdy stick each pole into the soil at least 4 to 6 inches. Here are some edibles that you should start staking today. 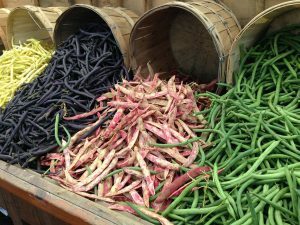 Although bush beans grow easily and produce pods quickly, pole beans, which require something to climb and twine on, produce heavier yields through a longer season. As an added bonus you don’t need to bend down to pick them. 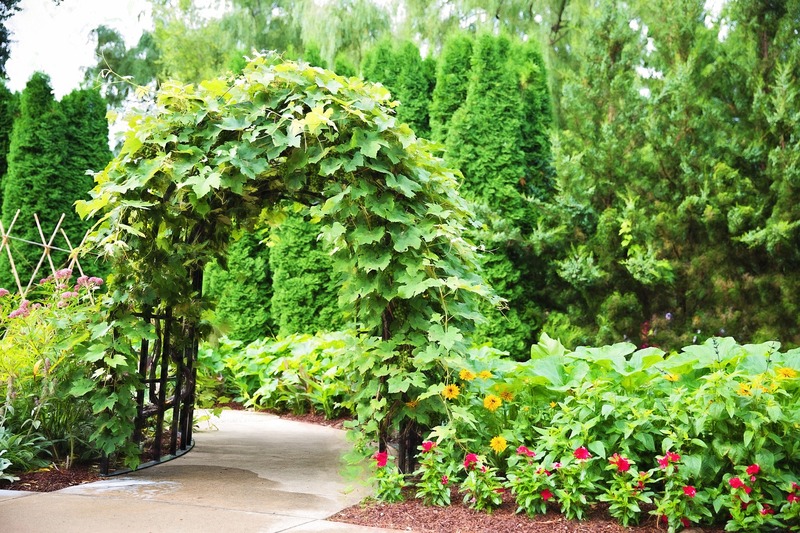 For more structure ideas on growing beans, check out Monica Brandies article in the Jan/Feb 2015 issue of FG. Beans do best when grown on vines. Unlike beans, peas have tendrils, which fasten themselves to items in your garden such as strings, wire, netting and other plants. Vining and climbing peas will benefit greatly from a trellis or vertical strings to climb on. If your structure doesn’t touch the ground, stick pea stakes – or twigs, brush – along the row to assist them in reaching the trellis. Yes, these bowling ball weighted fruits will also grow vertically when given a chance. Mary Jo Clark, a friend in Tampa, Fl. composted some biological waste from her relative’s rabbit enclosure. 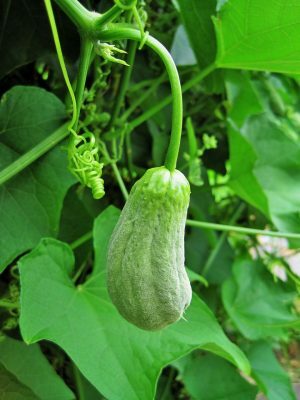 What grew out and up from the compost heap was a large vine of the green striped cushaw squash (Cucurbita mixta). The vine crept up along her front archway into a loquat tree that was as tall as her house. One night she was awoken abruptly by a thunderous crash. Her neighbors met her outside and to their dismay found a 20 lb squash flattened. She then started training the vine and created support under each of the fruits. In addition to building a strong A-frame trellis, possibly out of bamboo, PVC pipe, galvanized pipe or sturdy pallets, individual slings to support the fruit are helpful. The slings can be made out of old T-shirts, bird netting, mesh bags or pantyhose. Material that can expand as the fruit grows is ideal. Growing vertically has many benefits. What free materials do you have around the house that can be used as a trellis? Regardless of your expertise or the size and maturity of your garden, you will always have room to grow up. Originally published in the July/August 2015 issue of Florida Gardening.